In the wider Ballarat area that our Field Naturalists’ Group explores, we see a wide range of orchids. To raise the awareness of this special group of plants we are highlighting some of the orchids through the work of one of our past members. In 1992, Patricia (Pat) Murphy began a series of articles for the newsletter of Australian Plants Society Ballarat (formerly Society for Growing Australian Plants – Central Highlands Group). 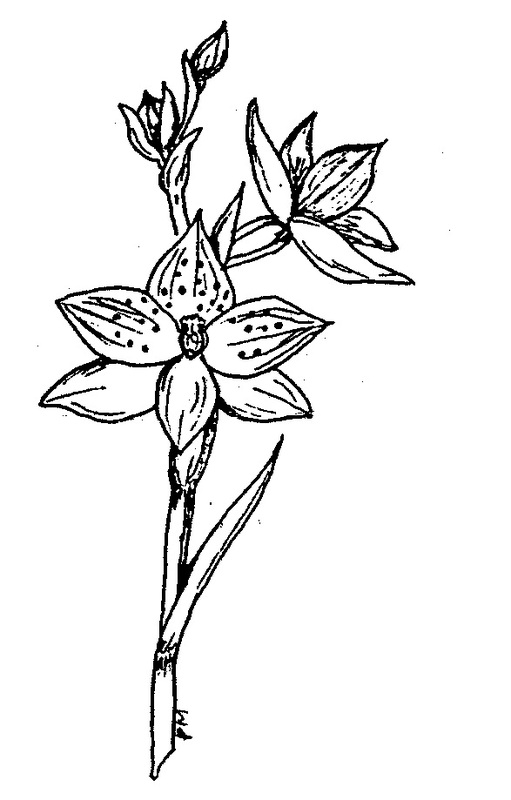 Pat wrote twenty-six short articles on the local orchids and provided the illustrations. While there are a few articles missing and we scanned photocopies of the illustrations (with permission), as we no longer have the originals, the work still highlights Pat’s botanical and artistic skill. Pat was a keen botanist and a valued member of our club. The National Herbarium of Victoria now houses her pressed plant collection due to it’s local significance. Some orchid names have been updated to keep up with current naming protocols and the illustrations are not to scale. Places we visit include Enfield, Dereel, Rokewood, Brisbane Ranges National Park, Wombat Forest, Canadian, Mt Cole, Beaufort, Sandon, Daylesford, Basalt, Meredith, Bamganie, Linton, Mt Doran, Lal Lal, Durham Lead, Clunes and Creswick. The dark red coloured orchid grows in scattered colonies throughout our district. It is found in cool shaded situations of open forests. Because of its deep colouring, the orchid blends well with its surroundings, thus making it difficult to find in the bushland. The leaf is more or less heart-shaped and wavy edged, red to purple beneath, dark green above, and clasping the reddish stem just a little above the ground level. It is a slender plant up to 17cm high and its dark red-purple flowers, from one to four, are unpleasantly odorous. The dorsal sepal, to about 3cm long, tapers to a fine point and the narrow lateral sepals, up to 1.5cm long, curve downwards and then upwards to fine points. The petals are quite small, about 5mm long. 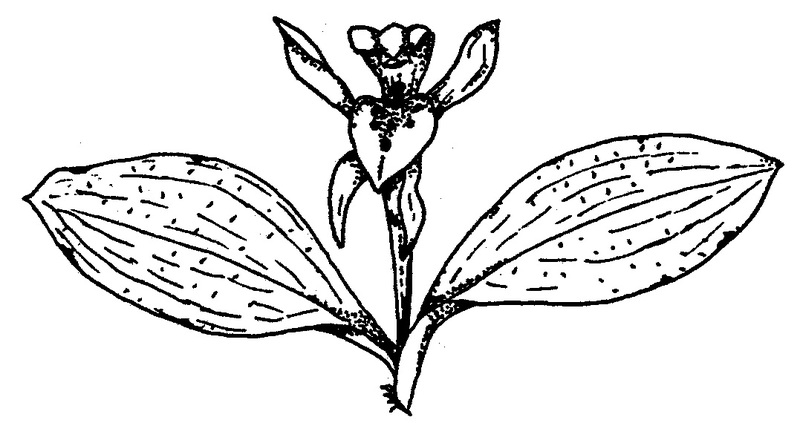 The labellum curves downwards, the lamina with two dark glands at the base. Usually they may be seen in the Enfield, Ross Creek, Teesdale, Mt Doran and Durham Lead Forest. Flowering time: Mid-May through to October. Acianthus pusillus is widespread throughout bushland to the south of Ballarat but is less common in areas to the north. It prefers damp, shady places in a variety of soils and habitats. This small slender plant grows up to 12cm high, with a single heart-shaped leaf which is green above and reddish-purple beneath, clasping the stem just above the ground level. The terminal raceme of 1 – 15 tiny flowers, each subtended by a small ovate bract, is usually a light brown colour with red, green or purple markings. The dorsal sepal ends in a prominent slender point; lateral sepals are narrow, acuminate and sometimes crossed and gland tipped. 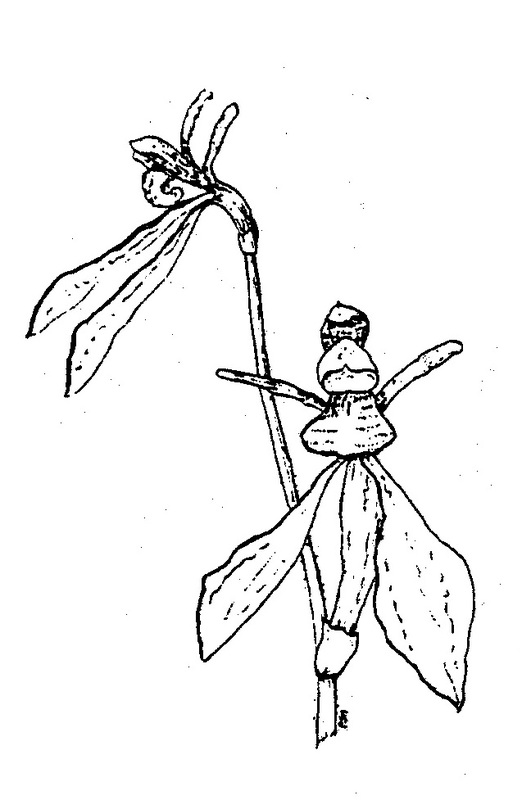 The labellum, ovate-lanceolate, 3 -5mm long, has two basal glands and a short pointed apex. The column is curved forward with a small concave end. This orchid is similar to Acianthus exsertus, a more robust plant which has larger flowers, the labellum is longer and the base of the lamina is truncate-cordate. This orchid belongs to the “carnea” group of caladenias (Eucalendenia). It is an extremely rare orchid in this district, although it is found scattered through other parts of Victoria eccept perhaps the north and the Mallee areas. The local plants have been found growing on well-drained clay/gravelly soils. The Black-tongue Caladenia is a slender plant, growing up to 18cms tall and with slightly hairy stem and a single slightly hairy linear leaf. The single flower (I have never found more than one flower per stem), is a beautiful bright pink. The dorsal sepal is narrow with a blunt apex and bends forward over the column while the lateral sepals and petals are spreading and both on the same plane. The three-lobed labellum is clawed and the centre lobe is long, narrow, and covered with tightly packed shiny and very dark red to black calli. The bright flowers and dark calli on the labellum are distinctive features of this orchid that provides easy identification of the plant. This small orchid can be found in our peppermint/stringybark lightly forested areas or in more open situations amidst heathland type vegetation. The plant is obviously glandular hairy and grows to 8 or 9 cms high with a fine grass-like leaf about 5 to 6cms in length. The single flower is a deep pink but with a cream coloured labellum with red crosswise markings. The dorsal sepal stands erect and bends inwards at the apex. The lateral petals and sepals are rounded at the ends are gland dotted and relatively broad. The flowers seldom open fully, giving the impression that the flower is just past the bud stage. This unusual caladenia is widespread in the district but I have never considered as a common plant. Flowering time is November and December. In the Ballarat district, this orchid is found in open forest or heathland. It is widespread but not locally common, although on rare occasions I has been seen in colonies of up to forty plants. The narrow basal leaf is purplish brown and a sheathing bract is attached at the base of the fine stem. The plant with its one to five distinct flowers grows to about 30cm high. This orchid gains its common name from the shape of the flowers which strongly resemble a duck in flight. 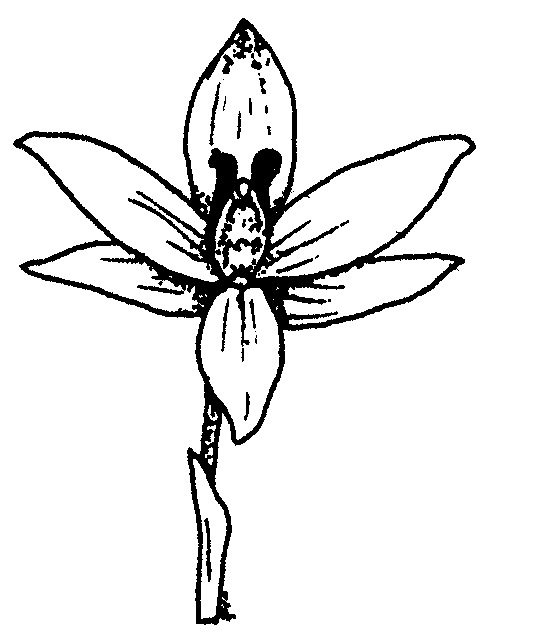 The inverted dark brown shiny flower has the labellum part uppermost and is the ‘head’ of the duck. The lateral petals spread back to form the ‘wings’ of the bird and the very large column wings form the ‘body’. Some of the areas where this orchid may been seen flowering are: Clunes, Creswick, Enfield, Ross Creek, the Brisbane Ranges and many of our roadsides. This orchid is widespread and locally frequent in the cooler, damp forests of our district. It is a glabrous plant, usually growing o about 6-7 cms high. The two thin ovate leaves are opposite one another at the base of the stem and are dark green. 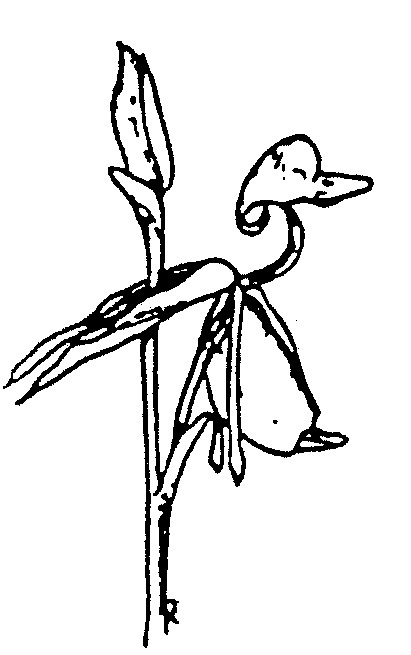 The single flower, on a rather short stork, is purplish brown to greenish purple but sometimes it may be wholly green. 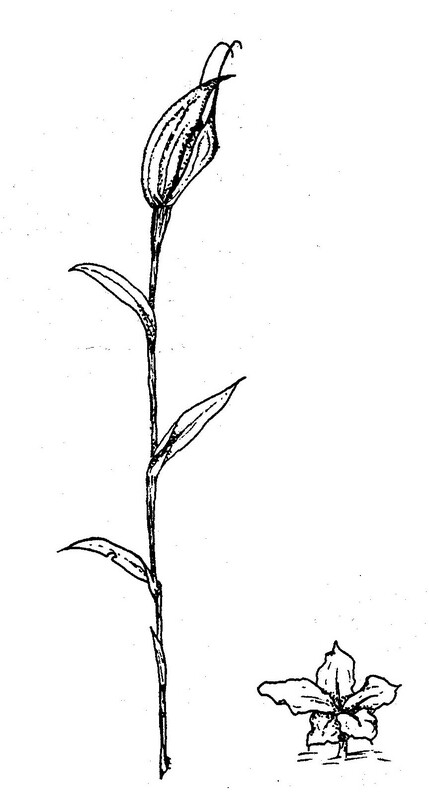 The dorsal sepal stands erect before finally curving forward and partly covering the column while the two lateral sepals hang downwards and are narrower. The labellum is oval and large and usually a dark reddish-brown colour. There is a stalked gland near the base and a large thick gland near the centre. Other small glands are in two uneven rows. After pollination, the flowering stem elongates to about 20cm, thus providing a means for the plant to disperse its seeds in the wind. In the Ballarat district, this charming little orchid is widespread but not common. It is a plant of our lighter open forests, growing on grassy sites, rocky ridge, clay or stony soils. This species is identified by the long dark hairs on the floral parts, especially on the labellum. The flowers are usually dark purplish brown and the labellum is highly moveable; even the slightest breeze causes it to wave about. The inflorescence is quite short, with the flowers small and congested. Generally, the plant is slender and erect; the leaf is not present at flowering time and a bract is attached to the stem below the spike. Locally, the Bearded Midge Orchid is quite small, only growing to a height of about 8 – 12cm. however, in a few localities a more robust form attains a height of 30cm or more, with larger floral parts and studier stem. (meaning; Greek: – crypto – hidden; stylus – column; in reference to the short column which is obscured by the basal lobes of the labellum). Flowering time: November to February. This slender yet robust orchid can be found in the wetlands of our wooded forests and heaths, particularly along the lower sections of drainage lines. It forms small colonies where the habitat is suitable but is not widespread in this district. The two or three oval to broad lanceolata, glabrous leaves are stalked and present at flowering time. The flowering stems, up to 40cm high has 2 -3 widely spaced stem bracts. Greenish yellow inverted flowers, usually 3 – 8, are in a loose terminal raceme and the subtending bracts are a medium greenish brown. The narrow lateral petals are similar to the sepals in shape but are smaller and paler. The prominent reddish-brown labellum is straight with two large projecting humps near the apex, while down the centre of the underside, two rows of deep purple ridges extend from the base. This group of orchids is pollinated by Ichneumon wasps. Flowering time: December to March (but plants may be seen flowering as late as May in some local areas). It is a leafless saprophyte and will be found growing among trees and shrubs where it can attach itself to the fungus on the root of a Eucalypt tree, which appears to be the commonest host plant. The sturdy purplish brown stem, up to 80cm tall, has scaly bracts near the base. The numerous flowers, in a terminal raceme, are pink with deeper pink spots and flecks, but occasionally may be very pale, white or without spots. The sepals and lateral petals are alike and spreading, and the obovate labellum has raised centre to the upper surface. This lovely orchid can be seen in most of our bushland areas but is not fond on the open plains to the west of Ballarat nor in the denser forests of the Wombat area. This pretty orchid is widespread in the Ballarat district where it can be found in grassland, heathland or open forest; especially in places where it is damp in winter. It usually occurs singly or in small groups, but it may also be seen growing in great profusion along some of our grassy and reedy roadsides to the south of Ballarat e.g. at Cape Clear and Rokewood. The 3 – 7 grass-like leaves are narrow linier, glabrous and about 10 – 15cm long. The flowers, 1 – 4, on slender stems, are a clear bright yellow with muted brownish markings near the centre. The lateral sepals spread downward along the underside of the labellum; the labellum is 3 lobed – the small side lobes are markedly toothed. The larger mid-lobe is ovate-lanceolata with two definite furry yellow ridges rising from the base and continuing for a short distance to become a single ridge towards at the tip. The lateral petals tend to lean forward. The plant usually reaches about 20cm high in this district. This plant with an erect stem up to 70cm tall, has several grass-like leaves and usually two sheathing stem bracts. The pretty flowers are sulphur yellow with a few brown markings. The ovate dorsal sepal is projected forwards with a pair of large, dark brown blotches near the base. The stalked yellow lateral petals curve back and the lateral sepals (or tails) hanging downwards and usually parallel, are brown and greenish yellow in colour. 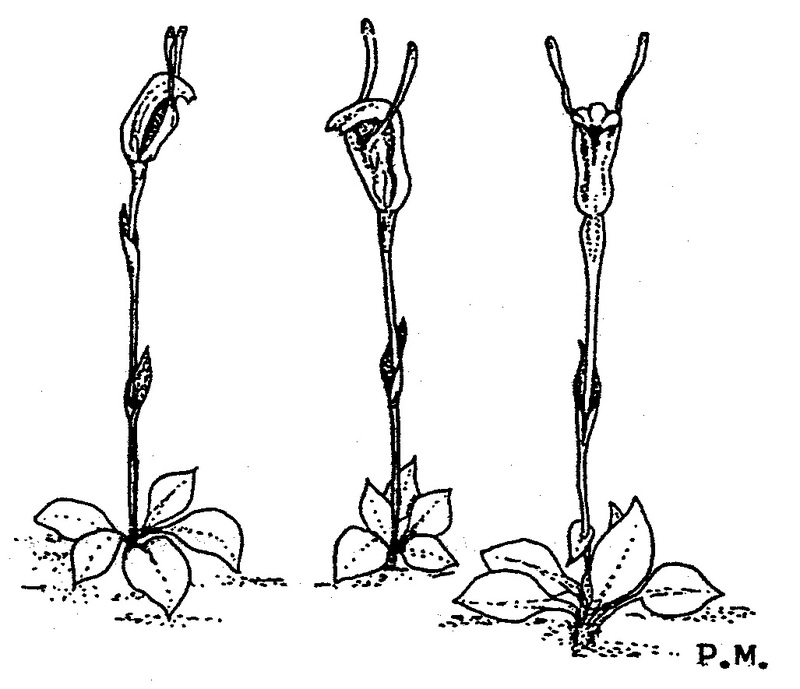 The three-lobed labellum has a cross bar of brown near the tip and a single raised ridge from the base to the middle of the lamina. It is known to hybridize with D. orientis, the Wallflower Orchid. The following are places where you might see this orchid – Berringa, Dreamers Hill, Creswick, Haddon, Rokewood, Mt. Beckwith. This orchid is slender, erect, pubescent plant, which usually grows from 3 – 12 cm high in this district. Usually the flower is pink and white, but a complementary cream flower is sometimes seen (for example in the Ross Creek bushland). The solitary basal, ovate leaf is much reduced or absent during the flowering period. The stem is thin, dark in colour with one to three flowers; the dorsal sepal is slightly spade-shaped. The white, occasionally pink, lateral sepals are the largest and most spectacular part of the flower. The yellowish labellum is slightly hairy, with gland patches here and there on its surface. This orchid is widespread and frequent in the open woodlands and grasslands of the Ballarat region. Leafless, saprophytic orchid without leaves or chlorophyll; with erect brown stem to about one metre high; some sheathing scales along the stem but more crowed at the base of the stem; up to 20 flowers forming a raceme and hanging loosely from short pedicels. Flowers dull brown on the outside creamy white on inside; the sepals and petals forming a five-lobed, pouched bell about 15mmlong. Only the tip of the labellum visible, yellow with wavy edges, ridged down centre and small glands towards tip. Found scattered throughout most of our cool moist forests e.g. Mt Warrenheip, Bolwarrah Forest, Barkstead Forest. The plant often prefers an area where deep leaf litter has accumulated. The common names are derived from the potato-like shape and colouring of the flowers and from their cinnamon perfume. (meaning: Greek – straight horns, in reference to the erect horn like lateral sepals). This interesting orchid is quite rare in the Ballarat district where it grows in somewhat moist conditions of open grassy forest. It is recorded for only two localities, with small numbers in each group; with some plants almost completely yellow. It is a self pollinating species. Usually about four grass like basal leaves surround the flowering stem which is rigid and up to 36cm high. There are one or two stem bracts and these have long sheathing bases. Several greenish to reddish-brown, almost sessile, flowers subtended by pointed floral bracts. The conspicuous dorsal sepal forms a broad hood over the column; the lateral sepals are narrow, linear and erect on either side of the hood and the petals are hidden. The labellum is smooth with a yellow central line and a large cone shaped callus at the base. Orthoceras is a genus with only one species in Australia. This orchid is widespread and frequent in either dry or moist places of our open forests. It is usually found as a single plant and is often supported by other plants such as the taller grasses, small grass trees, the taller mat rushes, low heaths etc. The flowering stem, about 10 to 40cm, is clasped by a number of narrow, lanceolate, green leaves but the rosette of basal leaves is usually absent at flowering time. The ten or more widely spaced flowers are in a terminal raceme and have translucent green and white stripes with pale reddish brown tips. The lateral sepals bend downwards and are joined for about half their length, while the galea is curved from the base ending in a short point. 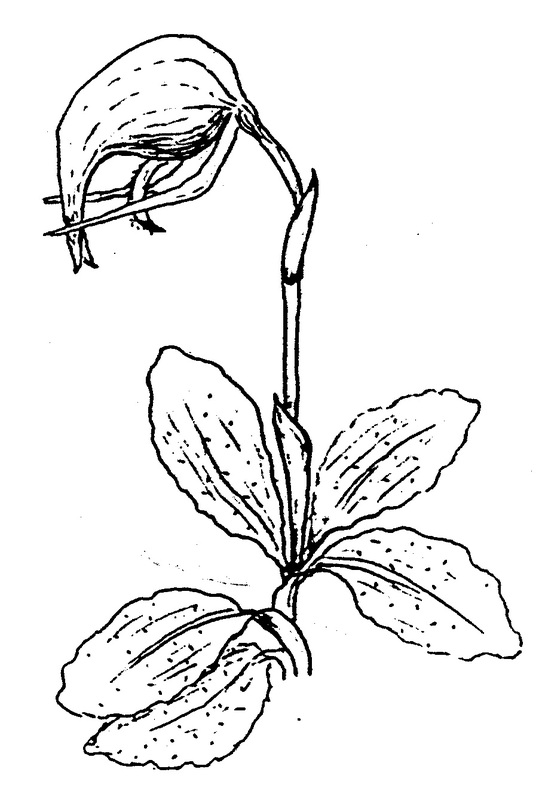 The highly sensitive labellum has an upturned and notched tip and the surface is hairy. This slender greenhood can be found in all types of country throughout the Ballarat area. It often grows in small colonies in the shelter of shrubs and trees of our lightly timbered areas but it also may be found in some of our more open spaces. This species has a rosette of small leaves encircling the base of the flowering stem and usually sheathing stem bracts are present as well. The variously striped green and white flowers are small. The lateral sepal points are erect and held well above the galea, each point being somewhat thickened or club-shaped. The galea is erect for two thirds its length and then bends forward, becoming almost horizontal. The short greenish-brown labellum with a blunt recurved tip is not visible from the outside. I have seen this orchid growing at Mt Beckwith, Bald Hills, Long Forest Road, Bungal, Dereel, Mt Erip, Sandon and Canadian. The Nodding Greenhood is one of the most widespread and familiar of our local orchids. It is frequently growing in quite large colonies and also in a wide range of habitats in lightly forested areas. The striped, mid-green hood is about 2.5cm across and bent well forward into a nodding position. Sometimes there are reddish or yellowish tones towards the flower tips. The sepals are about 3cm.long and bend up, reaching just above the hood. The labellum is long, strongly curved pale green with darker edges and a brownish central ridge, protruding well through the sinus. The solitary stem, 10-20cm high rises from a basal rosette of stalked leaves and has several sheathing bracts. Some of the areas where this greenhood may be seen flowering are: Mt Erip, Enfield, Mt Doran, Dolly Creek, Canadian, Creswick, Mt Beckwith and Linton. Flowering time is autumn to early spring. This little orchid is quite common throughout the Ballarat district and is usually found in the lighter forests and heathlands, mostly in the shelter of taller plants. The Tiny Greenhood is a slender and erect plant, about 10 – 30cm tall with small sheathing bracts. The basal leaves are on a side shoot but are seldom present at flowering time. There are up to 5 flowers in a terminal raceme on the long glabrous wiry stem; each very small, about 10mm long and turned to face the inwards. They are a translucent white with green stripes and often tinged with brown. The lateral sepals are erect on either side of the hood. The unusual inward facing tiny flowers help distinguish this species from all other greenhoods. Pterostylus striata grows to approximately 15cm high. A small rosette of leaves grows at ground level but these are separate to the flowering stem. The 3 to 5 alternating stem bracts are small, but increase in size towards the top of the stem. The single flower is green and white striped with purplish-brown colouring at the wide v-shaped sinus and again along the filiform apex of the dorsal sepal. The galea is erect but bends forward in the latter half while the lateral sepals embrace the hood and stand upright before curving forwards. An erect and pointed brownish labellum does not protrude through the sinus and is barely visible from the front view. This orchid grows in open woodlands, particularly in sandy places where bracken or a heath type understorey provide some shelter. It is not a common orchid in this district. Peak flowering time is January and February. This orchid is a slender to moderately robust plant with an erect flowering stem 10 – 40cm high. The 3 – 4 linear to spathulate leaves are basal and there are several bracts along the flowering stem. The many small fragrant flowers are arranged in a spiral spike, each with a surrounding green and slightly furry bact. Sepals and lateral petal are bright pink and the frilly labellum is glistening white with the edges curved inward. Austral Ladies Tresses grow in swampy or marshy places, often in water or areas that are intermittently flooded. It is considered to be a rare orchid in this district and is recorded in only three separate localities. Further afield it has been found in the Brisbane Ranges and also near Castlemaine. It is scattered throughout the temperate eastern and southern parts of Victoria as well as most other states. This slightly flexuose-stemmed and slender orchid grows approximately 18cms in height with narrow deep green grass-like leaf, 8 to 15 cms long. The flowers open freely from pale to bright yellow colour nad these are nicely perfumed. The column appendages are red-brown, long and clubbed, standing one on each side like a pair of ears. A fairly common orchid in heathlands and lightly forested areas. It is recorded at Enfield bushland, Durham Lead bushland, Haddon Common, Mt Beckwith Scenic Reserve, Clunes Roadside, Hillcrest uncommitted area and Inverleigh Flora Reserve. Widespread and quite common in most open bushland areas of the Ballarat district and particularly where the land has been left undisturbed. This attractive orchid can be a very slender to a moderately sturdy plant 10 – 20cm high. The leaf is about 15cm long, narrow and grass like. Fine stem bracts, usually 2, are approximately 20mm long. The flowers, 1 – 5, on slender stalks are mostly pink, blue or mauve; the dorsal sepal and lateral petals with deeper blue dots. The column is three lobed with white, pink or mauve hair tufts on the side lobes. Being a sun orchid, its flowers usually open fully during bright sunshine, but if weather conditions are cool or cloudy, the flowers stay almost fully closed. Sometimes flowers are without spots and quite often white flowers occur. A slender glabrous plant without leaves but with about 3 sheathing scales evenly spaced along the flowering stems. The reddish brown and green flowers are insect-like and usually 2 to 6 on alternate sides of a stem up to 12 cms high. The labellum is long and hinged at the centre; tip darker and bearing an arrangements with 3 glands at one end and with 2 purplish hairy tails at the other. The column is curved with four slender pointed lobes. This orchid is scattered throughout our district. Some of the areas include Clarendon Roadside, Mortchup Roadside, Creswick Forest, Bolwarrah Forest and Enfield Forest.